I haven't really tried tried anything new beauty-wise that can merit being called a 'favourite' of the month, purely because I haven't had time to use them enough! However, there have been a few things that I kept coming back to over the past month. 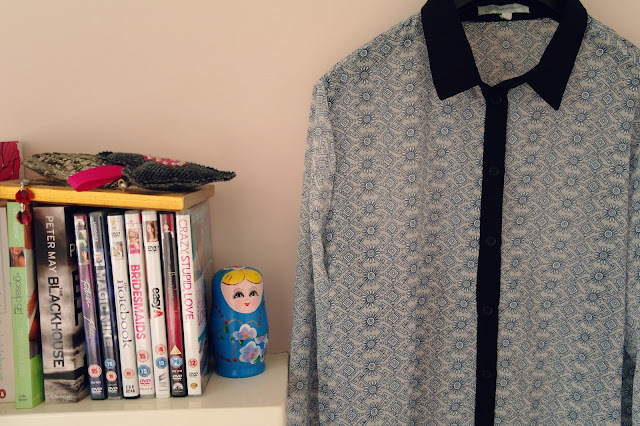 Shirt, Afflecks Palace- I bought this a few months back from a little independent store in Affleck's Palace, Manchester. It looks great with a pair of black skinnies and can be dressed up too! It's a little bit different which is why I love it. It featured in an outfit post a month or two back, which you can see here. Wish Bone & Feather Necklace, H&M- These two bracelets are both so delicate and pretty. I usually like big, chunky necklaces but these look really pretty together, and because of their neutral colour I can wear them with everything! Rose Necklace, New Look- I've had this necklace for a year or two and it's a favourite of mine. I like wearing it with a button down shirt, see my post Blue x 2. That's it for this month, but what have you been loving? Let me know in the comments! THAT ROSE NECKLACE. Oh my WORD is it perfect! !